There’s a famous story from the time ‘Seinfeld’ and ‘Curb Your Enthusiasm’ creator Larry David worked as a writer on ‘Saturday Night Live’ in New York in the 1980s. Frustrated at the producers undermining him and leaving all his ideas on the cutting-room floor, he lost his temper one night, unleashed a volley of abuse at his boss and walked away from the show. A few days later he realised that he’d made a terrible mistake but rather than apologise and grovel for his job back, he simply walked into the next writers meeting and said “I have a sketch about a trapeze artist”. Everyone was so stunned to see him walk back in without a care in the world that they simply carried on as if nothing had happened. It’s unclear – although on the evidence, probably unlikely – whether Theresa May is a Larry David fan. But she would be forgiven for thinking that the idea of simply walking back into Europe and never mentioning the Brexit-flavoured taste in everyone’s mouth is a rather tempting one, indeed. Although, if she were to take a leaf from David’s book, she’d be better off suggesting a sketch about a tightrope walker than a trapeze artist, such is the delicate position she finds herself in. Yesterday’s news that the planned Commons vote for today had been cancelled in the face of yet another certain defeat for the embattled prime minister is simply the latest humiliation for a politician who has increasingly taken on the role of a political piñata. In fact, it has become almost impressive to see the array of enemies currently lining up and sharpening their knives against her. Many of her former allies have turned their backs and, while she is well used to the sniping from the opposition benches, it is quite some time since any of us have seen such open revolt in the midst of a national crisis. And a crisis it truly is – not just for the UK, but for the EU as well and, from our perspective on this side of the Irish Sea, we’ve waved goodbye to a mere crisis and are now staring a full disaster in the face. As of lunchtime yesterday – and as we have already seen with this Brexit car crash, which is now becoming a full-on motorway pile-up, things may well have changed since then – May is not just facing off against the usual suspects in Labour, the SNP and the Lib Dems. 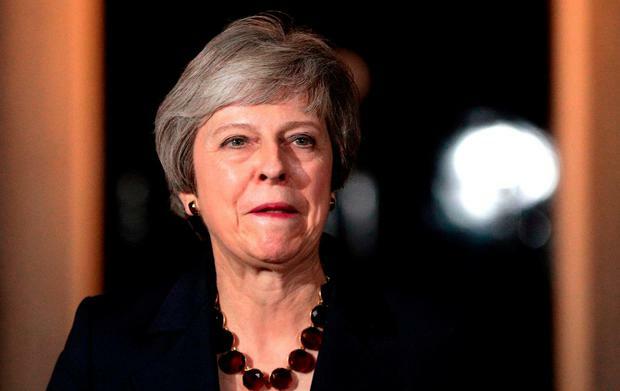 In fact, she was staring at the prospect of 110 of her own MPs crossing the aisle if the vote on the Brexit deal had gone ahead as scheduled – a personal and political disaster that she surely could not have survived. Apart from the errant MPs engaging in open mutiny, she now faces further challenges to her leadership from virtually every high-profile Tory. Apart from the obvious pretenders to her crown, such as Boris Johnson, Jacob Rees-Mogg and Michael Gove, the last few days have seen Sajid Javid, Jeremy Hunt, David Davies, Dominic Raab and David Lidington casting covetous eyes in the direction of her office. None of those would be good for the UK, and they would, in all likelihood, be utterly disastrous for us. But tempting though it undoubtedly is, the levels of schadenfreude exhibited in this country towards our nearest and dearest neighbour won’t help. Leo Varadkar and Simon Coveney have been playing hard-ball for the last few days and both men have stressed that the deal currently on the table is not just the best deal, but the only one. That will keep their EU masters happy for the moment, but the simple fact is that someone is going to have to blink first. A cadre of hardline Brexiteers won’t have any interest in the impact of the UK’s departure on us. And here’s the elephant in the Irish room – why should they? It is easy to forget, in the current ‘sturm und drang’ of the madness in Westminster, that a slender but undeniably clear majority of the UK’s voters opted to Leave. People can sneer at 17 million voters who decided to get out of the EU, but they can’t be ignored. Nor can they be lectured and told they knew what they were getting themselves into – for all the dire predictions of the so-called Project Fear, few doomsayers saw it becoming so bad that it would actually threatens the entire union. For all the talk of either of a general election and/or a second referendum, there seems to be a notable disdain for the very concept of democracy at work. We know in this country what it’s like to be ordered back to the polls to come up with a better result, but it’s unlikely that many of the UK voters would be quite so amenable. If we are to see a second referendum, which most of the British media, if not necessarily the British people, seem to want, what will they do if the decision is reversed but by a similarly slim margin? The fact that the final figures were 52-48 reminds us just what a close-run thing the first vote was. But while the smart money contends that a second vote would produce the ‘right’ result, the smart money also informed us ahead of the first ballot in June 2016 that Brexit hadn’t a hope of passing in the first place. If, as is possible if not necessarily probable, the vote gets reversed, where are the contingency plans to placate the millions who exercised their democratic duty in good faith the first time? The reason why there are no clear-cut answers is because, ultimately, there are no clear-cut questions. This has become a fractious and bloody Tory civil war which is turning us all into collateral damage. It’s also an ugly reminder that far from being sinister operators who had an evil secret plan all along, what we are witnessing is a full-scale emotional breakdown from people who simply don’t know what they’re doing. We often make the mistake of assuming that politicians, particularly the ones we don’t like, are brilliant, Machiavellian manipulators of the agenda. In fact, there is something almost comforting about the idea that at least someone knows what’s going on. But what we’re seeing is actually the true reality of Western politics – a combination of personal ambition, fuzzy logic, wishful thinking and the seemingly endless settling of old scores. It is, of course, tempting to sit back and watch the Tories squirm, and the behaviour of some of their ministers in relation to this country is a timely reminder that most of them know little about Ireland, North and south, and, what’s worse, care even less. But a disaster for the UK would be a catastrophe for us and, whether we like it or not, there is now a burning need for the Irish negotiators to try to help May as much as possible. Because no matter what we might think of her, she sure beats the alternatives from her own party. We’ve had Project Fear – now we’re entering Project Apocalypse.